Immomen's superhero work; it seems pretty good, but there's nothing interesting about it to me. 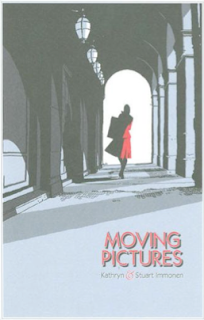 But "Moving Pictures" has a really cool look. This is a montage sequence of early 50's San Francisco at night. 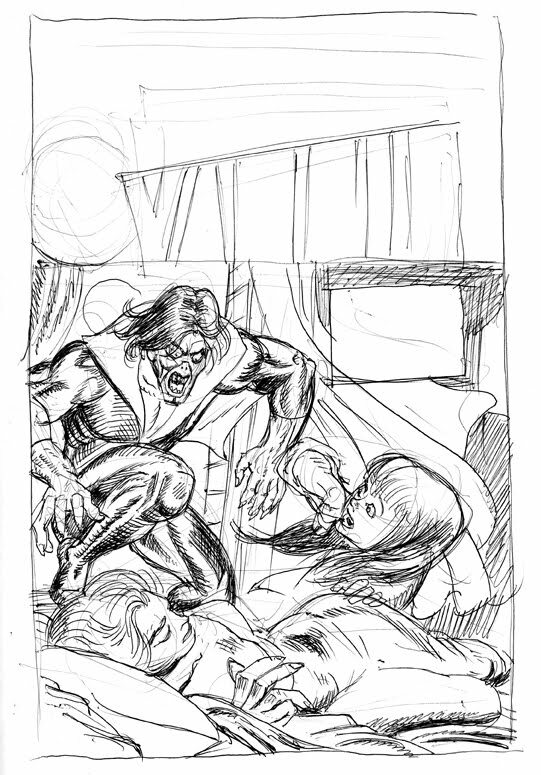 This is a recent sketch, a copy of a Gil Kane "Moebius The Living Vampire" cover from the early 70's. I love his compositional dynamism. 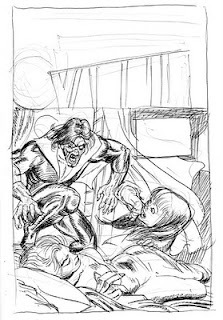 This is another example of breaking the panel grid for heightened dramatic effect. The triangular panels 1and 3 become like blades, metaphorically slicing panel 2, itself a sceneof Frank slicing Bone's face with a stiletto. smaller panels on page 76. The Vertigo Comics blog has an article about Fogtown. The Miami Herald reviewed Fogtown. They say that my art is "the perfect evocation of the story." that I penciled in the 9" x 6" format. There's a review of Fogtown in Frontiers now. Fogtown has now been reviewed in Monkeysee, an NPR pop culture blog. The San Francisco Chronicle reviewed Fogtown! This is particularly cool as Fogtown is set in San Francisco! Read it here. One of my favorite aspects of cartooning is casting; i.e., designing the cast of characters. Over the years I've saved old model packs from TV series I've worked on with the idea of repurposing characters in my own work. In these two pages, two characters are lifted from King of the Hill, which I was working on at the time. Frank Grissel's lawyer on pages 56 and 57 is based on the model of Peggy Hill's real estate agent boss, Chris Sizemore. The uniformed SFPD office on page 56 is Enrique, one of Hank Hill's co-workers at Strickland Propane. Page 57 is also the first appearance of Madam Tse, part of the criminal conspiracy afflicting the city by the bay. She went through several design permutations before we (Bob, Andersen and I) arrived at the current version. Andersen insisted that she sport the hairstyle worn by Jean Simmons in Angel Face. I'm posting two current items, one a news article and the other a review. Check them out!